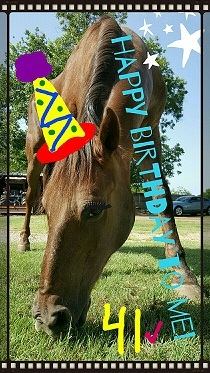 Happy 41st Birthday to me and Happy Trails To You! 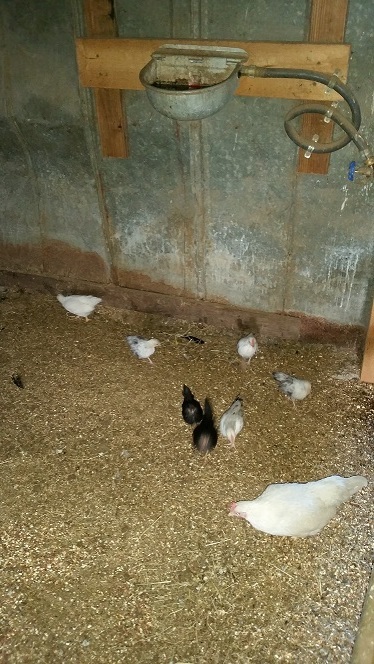 The larger chicken in the lower right hand corner is one of the baby chicks from this last Christmas. She surprised us all with a nest with some babies. Three are hers and four belong to two other hens that she claimed for a total of seven. The Keeper kept them in the tack room until they had feathers. They all have feathers now and the Mama has done a great job teaching them how to be chickens. They are months ahead of the last bunch. 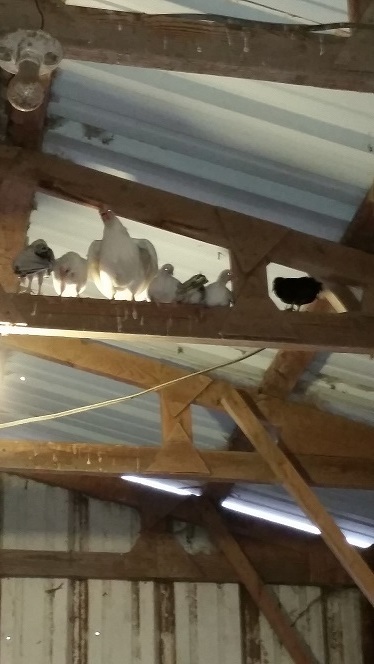 She already has six of the seven roosting in the rafters. They are months ahead of the previous ones that the Keeper had to teach to perch. But there is always one in every crowd. There is one that just hasn't gotten the message yet to go up. He will perch on the fence, but just can't seem to get up to the rafters yet. 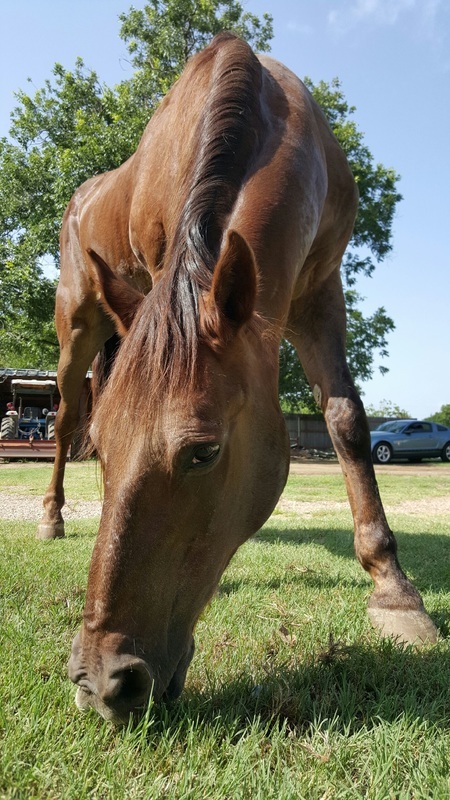 We will keep you posted, until then, Happy Trails To You! 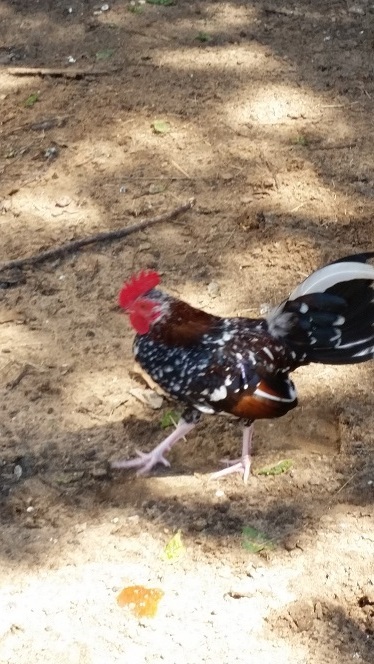 Meet the rare "wall chicken". Here is a fun tale for you to enjoy while the weather is too hot to do anything. I am under my fan munching on some treats when all of this transpired. The Keeper was feeding everyone and checking on everyone's welfare. 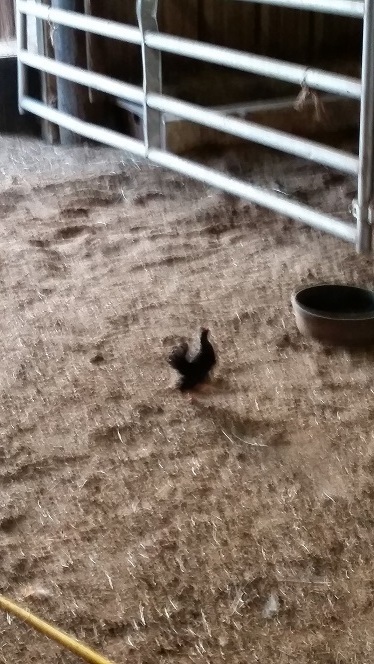 We have seven baby chickens in the tack room with their mom and they make all kinds of noise. The Keeper noticed a peeping coming from the wall of the barn. 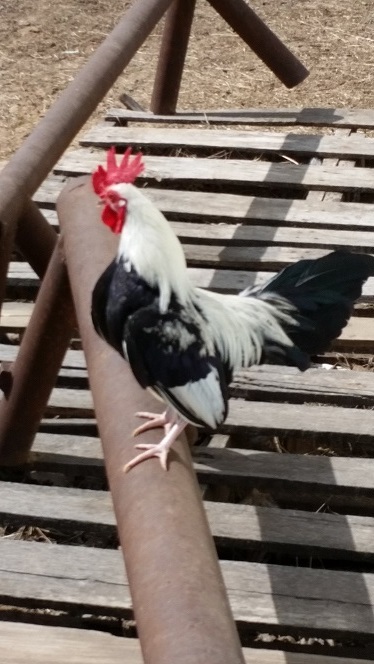 Following the sound, she figured out that one of the chickens had laid eggs up above on a shelf over the stalls. 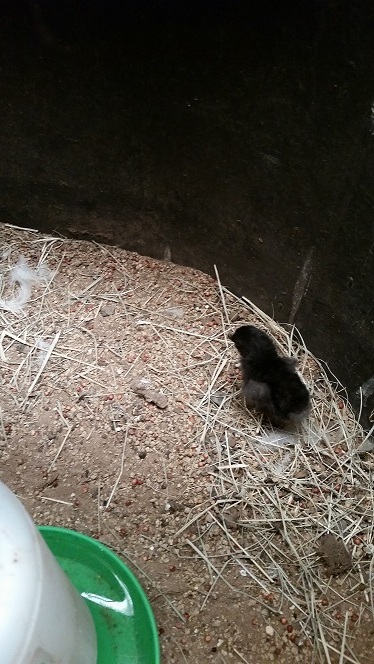 Apparently, one had hatched and it had fallen into the crack between the wall and the insulation. She thought at first it was just the echo of the other chicks and was jokingly been calling it the ghost chicken. Today he was louder and very obviously not an echo. I got to watch the Keeper try to fish him out from the top of the stalls. That did not work. Then she tried to dig him out from underneath. That did not work. 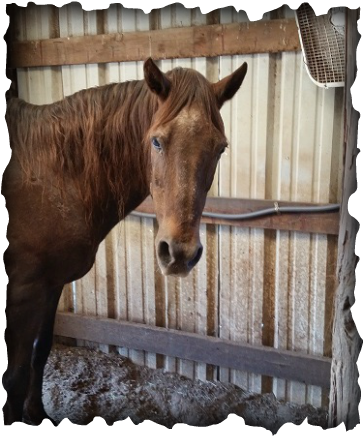 She went in the tack room and pulled insulation and boards and still couldn't get to him. In the meantime, the temperature keeps rising. When I took my afternoon nap, she was still trying to pry the outside wall off of a telephone pole. The Sire finally came out to lend some assistance. Between the two of them, they pried, pulled and propped open the wall just enough to see the rare "wall chicken". It was wedged where it could not move between two boards and a bunch of wires. The Sire held the wall and the Keeper pulled the little guy out. So far he is doing fine. 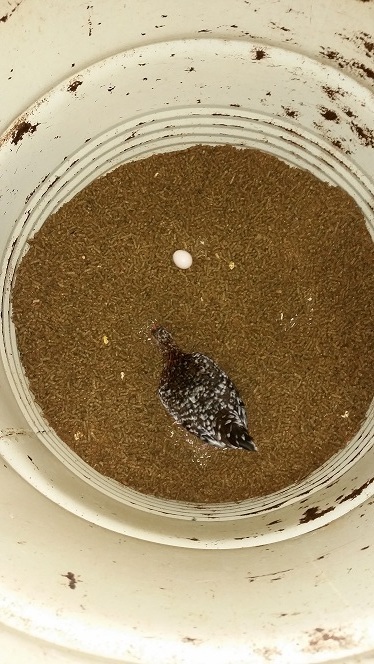 He is in the tub with another hen and her eggs. 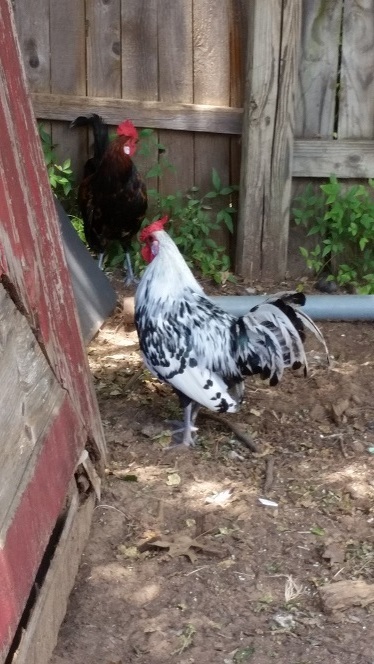 The Keeper is hoping the hen will adopt him, if not, he will be raised by the Keeper. Anyway, I thought I would share the story and show you the picture of the rare "wall chicken". Happy Trails to You! Meet The Rooster Rogues Gallery. .. 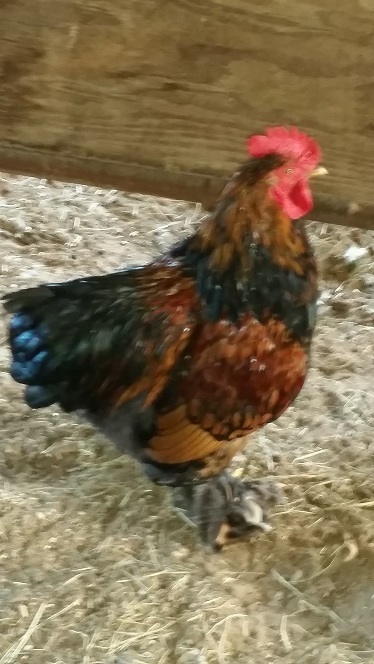 This is our crew of rooster babies all grown up. They were mere babies in January. 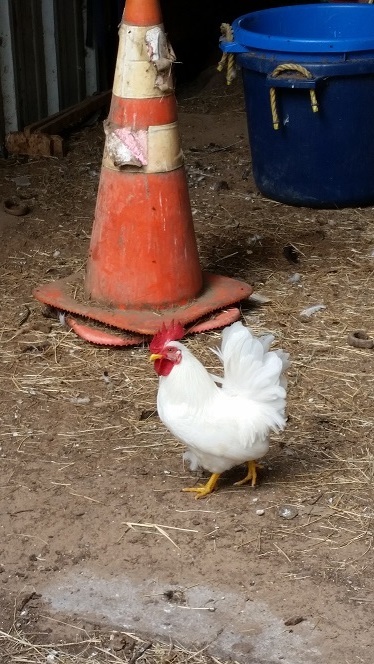 Now they are a force to be reckoned with, aside from annoying me, they chase predators away from the barn. 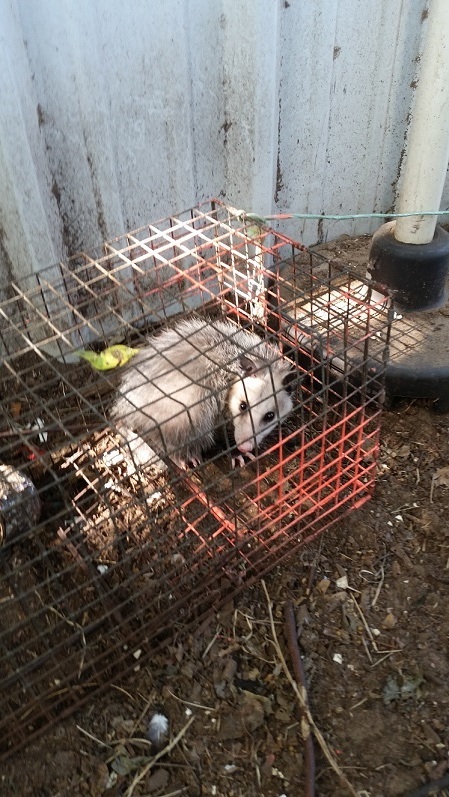 They chased this poor little guy into the trap. I swear, he slammed the door closed after him. After the ruckus the roosters made, I don't blame him in the least. 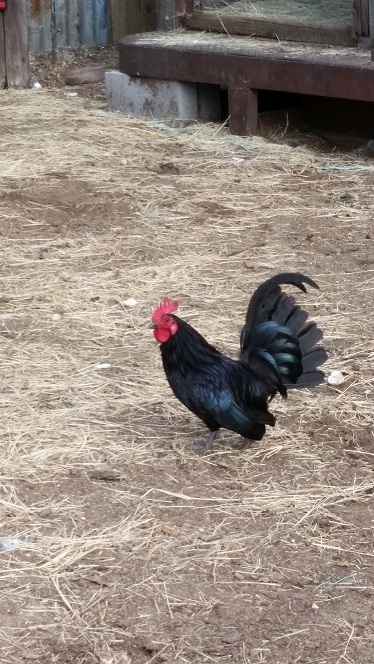 So even when I am out grazing, those pesky chickens are everywhere. 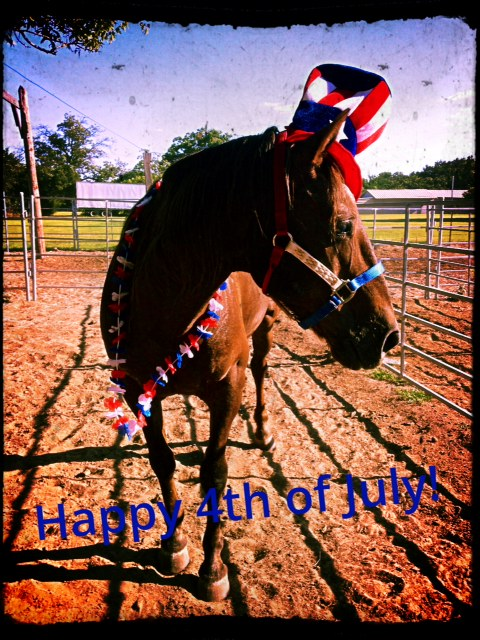 Be safe and Happy Trails To You! Someone Needs To Do Something! This is in reference to my previous post, just look! Someone needs to do something. Not only are those chickens everywhere, now they are laying eggs in MY food! Back to my fan, I go! Okay, I generally don't complain, but look at my face. This is not the face of a happy horse. There are some things that just need to be kept sacred. My food being the priority. Can someone please explain to those rotten chickens that inhabit the barn that my food is NOT meant for their personal entertainment! I mean eating their chicken scratch is my privilege, I'm Pie. They do not have the same rights. Someone please explain it to them. As you can tell, I had to go stand under my fan to cool off! Not really part three, just the third time we have posted this. Hopefully the text will post with it this time. This is a good story and I think you will enjoy it. 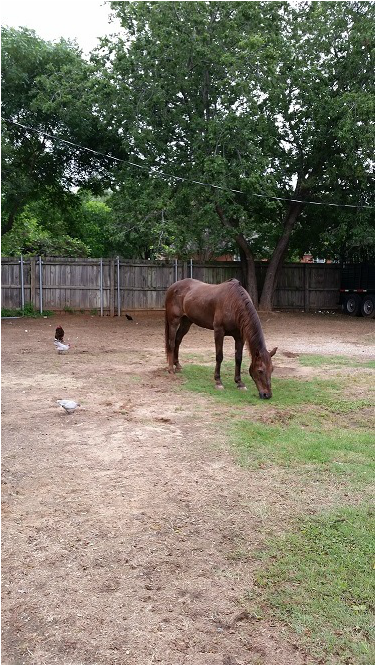 We all know how the keeper has an ongoing battle with all kinds of critters to keep them from eating her chickens. This includes opossums, hawks, raccoons, and dogs. She is diligent and plugs all the holes as she finds them, but sometimes even diligence is not enough and we lose some. The Keeper was opening the gate to leave yesterday and she noticed a large full grown red tailed hawk in the neighbor's tree. 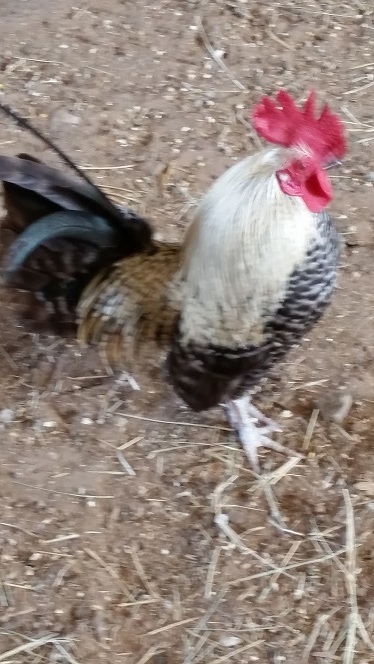 He was a gorgeous specimen and the Keeper was admiring his looks as he sat there since he was no where near the barn or our chickens. 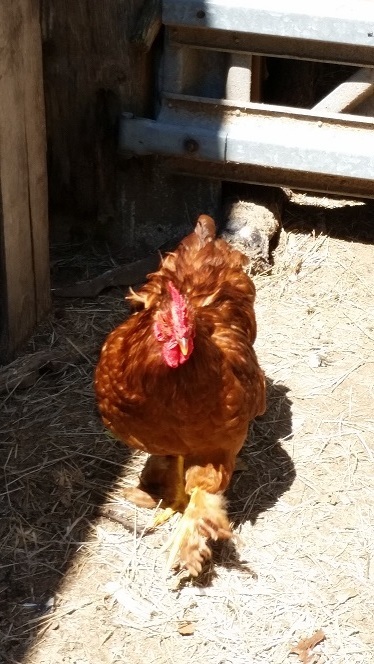 At that moment, the Keeper realized he was looking at something on the ground that just happened to be a small bantam hen. The Keeper and the hawk dove at the same time. Point goes to the hawk because he got there first and pinned the chicken. The Keeper was a few seconds behind. Not being one to give up easily, the Keeper started yelling and waving her arms. Point to the Keeper because the hawk let go of the chicken. As the Keeper dived for the chicken, the hawk was trying to get away from this crazy human person. The hawk, the Keeper and the chicken all ended up in a tussle. 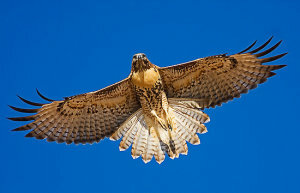 The hawk got away with no injuries and the Keeper suffered minor scratches from the escaping hawk. 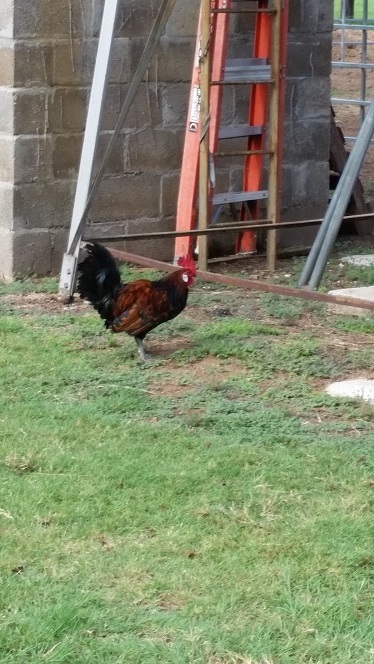 Even though the hawk and the Keeper tied, the real winner was the bantam hen. She gets to live to eat bugs for another day. Yea!